IL-33 (IL-1F11) binds ST2 (IL-1R4), both of which are associated with optimal CD4+ Th2 polarization. Exogenous IL-33 drives induction of Th2-associated cytokines and associated pathological changes within the gut mucosa. Th2 polarization is also a prerequisite to expulsion of the intestinal-dwelling nematode Trichuris muris. In this study, we demonstrate that IL-33 mRNA is expressed early during parasite infection and susceptible mice can be induced to expel the parasite by a regime of exogenous IL-33 administration. IL-33 prevents an inappropriate parasite-specific Th1-polarized response and induces IL-4, IL-9, and IL-13. This redirection requires the presence of T cells and must occur at the initiation of the response to the pathogen. Interestingly, exogenous IL-33 also induced thymic stromal lymphopoietin mRNA within the infected caecum, an epithelial cell-restricted cytokine essential for the generation of Th2-driven parasite immunity. IL-33 also acts independently of T cells, altering intestinal pathology in chronically infected SCID mice, leading to an increased crypt length and intestinal epithelial cell proliferation, but reducing goblet cell hyperplasia. Thus, the ability of IL-33 to induce Th2 responses has functional relevance in the context of intestinal helminth infection, particularly during the initiation of the response. The IL-1 family of cytokines are extremely potent proinflammatory cytokines, able to influence a wide variety of cell types. They typically require posttranslational processing, using cellular proteases to cleave precursor forms to produce a mature cytokine. These cytokines, which include IL-1α, IL-1β, IL-1 receptor antagonist, and IL-18, play key roles in the rapid initial response to pathogen invasion; indeed, dysregulation of these cytokines and the resultant inflammatory cascade can have profound pathological effects (1, 2). Recently, this family of cytokines has been extended; IL-33 is structurally closely related to IL-18, requires posttranslational processing, and binds the receptor complex consisting of the orphan IL-1R family member ST2 (3) and the IL-1R accessory protein (4). ST2 is expressed on mast cells and Th2 cells (5, 6) and has been shown to play an important role in Th2 responses (7, 8). IL-33 induces IgE-independent production of IL-13 from both human and mouse mast cells (9, 10) and can operate in coordination with the epithelial cell-restricted cytokine thymic stromal lymphopoietin (TSLP)3 on mast cells to maximize Th2-associated cytokines and chemokine production (11). Likewise, IL-33 has been described as a chemoattractant of Th2 cells (12) and as a potent inducer of these cells, enhancing IL-4, IL-13, and IL-5 production (3). Exogenous IL-33 also induces profound pathological changes in mucosal tissues, an effect thought to be dependent on IL-13 (3). Timely initiation of an effective Th2 response is essential to control extracellular intestinal helminths. Once established, this polarized immune response activates a battery of antiparasite measures, which radically alters the mucosal niche, ultimately allowing expulsion of a variety of different gut-dwelling pathogens (13). The bridge, however, between the innate sensing of the invading extracellular parasite and the subsequent downstream generation of an adaptive Th2-polarized response is poorly defined. In this study, we use the intestinal-dwelling nematode whipworm Trichuris muris, a well-studied natural infection model that closely mirrors the immunology associated with the human parasite Trichuris trichiura (13, 14). Immunity to T. muris is critically dependent on a Th2-polarized response and associated cytokines IL-4 and IL-13 (15, 16). In this study, we demonstrate IL-33 as a potential link between innate and adaptive immunity to intestinal parasite infection. We show IL-33 is produced very early during T. muris infection and an excess of this cytokine is a potent inducer of adaptive immunity to this parasite; also, we identify a T cell-independent role for IL-33 in the exacerbation of parasite-induced pathology. Taken together, these studies illustrate that IL-33 plays two independent roles in the context of an intestinal nematode infection, providing the initial impetus for Th2 polarization upon infection and at the site of infection acting as a T cell-independent proinflammatory cytokine, influencing the gut tissue inflammatory response to parasite invasion. Mouse IL-33 cDNA was cloned from IL-1-stimulated murine fibroblasts by RT-PCR using specific primer pairs (5′-CGGATCCACTTCACTTTTAACACAGTC and 5′-GAGATCTTTAGATT TTCGAGAGCTTA). The sequence-confirmed IL-33 cDNA was inserted into expression vector pQE and fused with His-tag (Qiagen) before being transformed into Escherichia coli (M15 strain). IL-33 protein was induced by isopropyl β-d-thiogalactoside and purified by Ni-NTA affinity chromatography, followed by polymyxin B column to remove endotoxin. The purity of IL-33 was >95% and endotoxin levels were <0.01 eu/μg protein (BioWhittaker Limulus Amebocyte Lysate QCL-1000 pyrogen testing). The bioactivity and specificity of the rIL-33 were confirmed by the ability of the proteins to induce IL-5 production using Th2 cells polarized from wild-type or ST2−/− mice. AKR, BALB/c, and SCID mice (Harlan Olac) were maintained in individual ventilated cages within the Biological Services Unit at Manchester University. Mice were infected when 6–8 wk old with experimental groups containing five mice; all work was performed under the regulations of the Home Office Scientific Procedures Act (1986). T. muris was maintained, as previously described (17). Mice were orally infected with ∼100 infective eggs, and parasite burdens were assessed on days 21 and 35 postinfection (p.i.). T. muris excretory/secretory (ES) Ag was prepared from adult worms following 4 h in vitro culture. A total of 0.8 μg of human rIL-33 was injected i.p. every third day, either days −1 to 20 p.i. or days 35–49 p.i. Mesenteric lymph nodes (MLN) were removed aseptically, and a single cell suspension was created in RPMI 1640 supplemented with 10% FCS, 2 mM l-glutamine, 100 U/ml penicillin, and 100 μg/ml streptomycin (Invitrogen Life Technologies). MLN cells at 5 × 106 cells/ml were cultured with 50 μg/ml T. muris ES Ag at 37°C for 24 h. Supernatants were assayed using a custom cytometric bead array kit (CBA) for IFN-γ, TNF-α, IL-6, IL-10, IL-4, IL-13, and IL-9. IL-17 was measured by ELISA (BD Biosciences). Serum was assayed by ELISA for parasite-specific IgG1 and IgG2a, as described previously (18). Briefly, 96-well plates were coated with 5 μg/ml T. muris ES Ag and incubated with serial 2-fold diluted serum. Bound Ig was detected using biotinylated anti-murine IgG1 (AbD Serotec) and IgG2a (BD Biosciences). Caecal tissue was fixed in 4% formaldehyde in PBS, paraffin embedded, sectioned at 5 μm, and stained for intestinal goblet cells with periodic acid and Schiff’s reagent (Sigma-Aldrich). Goblet cells were assessed by counting cell number per 20 crypt units, two sections per animal. Caecal crypt length and submucosa depth were measured using ImageJ analysis software (National Institutes of Health). Intestinal epithelial cell (IEC) homeostasis was assayed using BrdU to identify proliferating cells within the caecal epithelium. Mice were injected with 10 mg of BrdU 16 h before sacrifice, and nuclei that had incorporated BrdU in this time period were visualized using an anti-BrdU Ab (Mas 250b; Harlan Sera Laboratories), as described previously (19). Sections were analyzed by noting the location of the highest BrdU-stained cell for each crypt; this was achieved by counting the number of cells up the crypt axis to the most luminal BrdU-stained cell; 40 crypts were counted per mouse. MLN cells were isolated, as described above. Before intracellular cytokine staining, these cells were first stimulated with ES parasite Ag for 4 h with 3 μM monensin (Golgi Stop; BD Biosciences) for the final 2 h. These cells were then stained for surface CD4, fixed in 2% formaldehyde PBS, and permeabilized in 0.1% saponin (Sigma-Aldrich). Cytokines were stained for using anti-IFN-γ (XMG1.2) and anti-IL-4 (11B11); 1.5 × 105 cells were then acquired on a FACSCalibur. To identify NK cells in SCID mice, cells were surface stained for CD49b (DX5) (all BD Biosciences). Caecal tissue was snap frozen in TRIzol (Invitrogen Life Technologies), and mRNA was extracted as per instructions. cDNA was generated using an IMPROM-RT kit (Promega). ABsolute QPCR SYBR Green (ABgene) was used for quantitative PCR, and genes of interest were expressed relative to housekeeping gene hypoxanthine phosphoribosyltransferase (HPRT) as a fold difference to uninfected naive message levels (20). Significant differences (p < 0.05) between two experimental groups were determined using Student’s t test. BALB/c mice are naturally resistant to T. muris with expulsion dependent on parasite-specific CD4+ Th2 cells. IL-33 is considered a potent Th2-inducing cytokine (3); thus, we investigated whether T. muris infection in these resistant mice was associated with the production of IL-33 mRNA. By day 3 p.i., we observed a 20-fold increase over the naive baseline in caecal IL-33 mRNA levels, and by day 7 this had reduced to 5-fold (Fig. 1⇓A). These data suggest that early IL-33 generated at the site of infection could potentially orchestrate the subsequent T. muris-specific Th2 response; corroborating this, we were unable to detect IL-33 message levels above the naive baseline in infected susceptible AKR mice (data not shown). T. muris infection induces IL-33 mRNA synthesis; exogenous IL-33 causes T. muris expulsion in normally susceptible mice. BALB/c caecal cDNA was taken at various time points post-T. muris infection; quantitative PCR was then performed for IL-33 and expressed relative to HPRT as a fold difference to uninfected levels; values represent mean ± SE for three animals per group. ∗, Significant difference between naive and infected mice (p < 0.005) (A). IL-33-treated (□) and control AKR mice (▪) were orally infected with ∼100 embryonated T. muris eggs. IL-33 was given days −1 to 20 p.i. Caecal worm burdens were assessed day 21 and 35 p.i. (B). Goblet cell number (C and D) and caecal crypt length (E) were measured as indicators of infection-associated pathology. CCU = Caecal crypt unit, scale bar = 100 μm. Day 21 p.i. ; values represent mean ± SE for five animals per group. Dashed lines represent mean naive levels. ∗, Significant difference between IL-33-treated and control mice (p < 0.05). T. muris given to susceptible mouse strains results in a chronic infection (21), generating a polarized CD4+ Th1 response to the parasite. This response is plastic and can be redirected; both IL-4 (15) and IL-13 (16) when given exogenously can induce Th2-driven resistance. To examine the role of the Th2-inducing cytokine IL-33 (3), susceptible AKR mice were infected with T. muris and treated with rIL-33. This cytokine was given early, as the parasite was establishing within the caecum (days −1 to 20 p.i. ), thus assessing the ability of IL-33 to alter the initiation of a pathogen-specific T cell response. IL-33-treated mice exhibited enhanced resistance to infection compared with control-treated mice. Mean worm burden was reduced by day 21 p.i., and by day 35 p.i. IL-33 had induced complete parasite expulsion (Fig. 1⇑B). Consistent with the ability of IL-33 to induce a mucosal goblet cell hyperplasia (3), infected treated mice demonstrated greater numbers of caecal goblet cells during infection (Fig. 1⇑, C and D), although this was restricted to the site of infection and not evident in the colon (data not shown). Interestingly, crypt length was reduced in the same animals, most likely due to T. muris-induced caecal pathology resolving as the parasite was expelled (Fig. 1⇑, C and E). These data indicate the presence of T. muris larvae within the caecal mucosa of resistant mice rapidly causes IL-33 mRNA synthesis and rIL-33 can induce host protection. As demonstrated, IL-33 induces T. muris expulsion from normally susceptible AKR mice; in this study, we investigate whether there was a concurrent switch in T cell polarization. Parasite-specific MLN cytokine responses were profoundly altered. IFN-γ, TNF-α, and IL-17 were reduced by IL-33 treatment, whereas IL-4, IL-13, and IL-9 were all elevated. IL-10, essential for regulating gut pathology (22), was again reduced, also reflecting the resolving caecal pathology, and thus reduced requirement for regulation in treated mice (Fig. 2⇓A). Furthermore, IL-33 treatment reduced the frequency of CD4+ IFN-γ+ cells and elevated the prevalence of CD4+ IL-4+ cells within the MLN (Fig. 2⇓B). Coincident with this was a switch in parasite-specific IgG isotypes, IL-33-increased IgG1 levels, and reduced IgG2a (Fig. 2⇓C). All these data are consistent with the ability of IL-33, if given at the initiation of the antiparasite response, to switch Th polarization from a Th1 to Th2 phenotype. Exogenous IL-33 switches the parasite-specific Th cell polarization from Th1 to Th2. IL-33-treated (□) and control AKR mice (▪) were orally infected with ∼100 embryonated T. muris eggs. IL-33 was given days −1 to 20 p.i. MLN cells were isolated and cultured with parasite ES Ag for 24 h; supernatant levels of IFN-γ, TNF-α, IL-6, IL-10, IL-4, IL-13, and IL-9 were measured by CBA and IL-17 by ELISA; all cytokine data are ng/ml, with the exception of IL-4, which is pg/ml (A). Frequency of freshly isolated CD4+ IFN-γ+ and CD4+ IL-4+ MLN cells day 21 p.i. was determined by intracellular cytokine staining and FACS analysis; data represent proportion of cytokine-positive cells as a percentage of the total CD4 pool (B). Serum levels of parasite-specific IgG1 and IgG2a were measured day 35 p.i. by ELISA (C). Values represent mean ± SE for five animals per group. Dashed lines represent mean naive levels. ∗, Significant difference between IL-33-treated and control mice (p < 0.05). Clearly, IL-33 influences naive T cells at the initiation of a parasite-driven immune response; whether this effect extends to the redirection of an established T cell response remains to be elucidated. To address this, an established chronic T. muris infection was treated with IL-33 (days 35–49 p.i.). By this time, infection is typified by an ongoing regulated Th1 response and a patent self-sustaining parasite (23). Late treatment of IL-33 had no significant effect on T. muris worm burden. Both treated and control AKR mice maintained a chronic infection (Fig. 3⇓A). Despite this, IL-33 did increase the severity of infection-induced gut pathology. Crypt architecture became disrupted, leading to a reduction in crypt length (Fig. 3⇓, B and C). Also, contrary to expectations, IL-33 reduced the number of caecal goblet cells (Fig. 3⇓D), and consistent with the elevated pathological response colonic submucosal lymphoid patches were formed (24) (Fig. 3⇓B). Thus, IL-33 is unable to induce resolution of a chronic intestinal nematode infection; however, in this context, the cytokine has a detrimental effect on the regulation of T. muris-induced caecal pathology. Exogenous IL-33 fails to induce expulsion of a patent chronic T. muris infection, although caecal pathology was altered. IL-33-treated (□) and control AKR mice (▪) were orally infected with ∼100 embryonated T. muris eggs. IL-33 was given days 35–49 p.i. Caecal worm burdens were assessed day 50 p.i. (A). Goblet cell number (B and D) and caecal crypt length (C) were measured as indicators of infection-associated pathology. CCU = Caecal crypt unit, scale bar = 100 μm, CSP = colonic submucosal patches. Values represent mean ± SE for five animals per group. Dashed lines represent mean naive levels. ∗, Significant difference between IL-33-treated and control mice (p < 0.05). As described, IL-33 fails to alter a chronic T. muris infection; in this study, we investigate whether the established Th1-polarized response associated with this prolonged infection was also unaltered by the presence of excess IL-33. IL-33 treatment failed to influence the established Th1 response; IFN-γ production by parasite Ag-restimulated MLN cells was unaltered, as was the frequency of CD4+ IFN-γ+ cells within the MLN (Fig. 4⇓, A and B). Production of other inflammatory cytokines such as TNF-α, IL-6, and IL-17 was also not significantly altered by IL-33 treatment, whereas the low levels of Th2 cytokines IL-4, IL-13, and IL-9 were enhanced, as was the frequency of CD4+ IL-4+ cells within the MLN (Fig. 4⇓, A and B). The subtle changes observed in T cell polarization were insufficient to alter the IgG class isotype; IL-33 had no significant effect on parasite-specific IgG1 and IgG2a levels (Fig. 4⇓C). Thus, despite the dominating Th1 response, IL-33 does enhance a low level parasite-specific Th2 response. Nevertheless, these IL-33-induced effects were unable to influence a committed Th1 immune response, and a chronic T. muris infection was maintained. An established polarized Th1 cell response found in the context of a chronic T. muris infection is unaltered by excess IL-33. Day 50 p.i. MLN cells were isolated and cultured with parasite ES Ag for 24 h; supernatant levels of IFN-γ, TNF-α, IL-6, IL-17, IL-10, IL-4, IL-13, and IL-9 were measured by CBA; all cytokine data are ng/ml, with the exception of IL-4, which is pg/ml (A). Frequency of freshly isolated CD4+ IFN-γ+ and CD4+ IL-4+ MLN cells day 50 p.i. was determined by intracellular cytokine staining and FACS analysis; data represent proportion of cytokine-positive cells as a percentage of the total CD4 pool (B). Serum levels of parasite-specific IgG1 and IgG2a were measured day 50 p.i. by ELISA (C). Values represent mean ± SE for five animals per group. Dashed lines represent mean naive levels. ∗, Significant difference between IL-33-treated and control mice (p < 0.05). As already stated, T cells, specifically Th2 cells, highly express the IL-33R ST2 and are therefore likely to be the principal cell type responding to exogenous IL-33. Thus, it seems reasonable in the absence of T cells that the IL-33-mediated effects would be abrogated. To test this, we infected immunodeficient (SCID) mice with T. muris and gave IL-33 early (days −1 to 20 p.i.) to alter initiation of any antiparasite response. Unlike AKR mice (Fig. 1⇑B), the normal susceptible phenotype of SCID mice was unaltered by early exogenous IL-33, both treated and control groups maintaining a chronic infection through to day 35 p.i. (Fig. 5⇓A). Despite this, infection-associated pathology was influenced by IL-33. We again observed increased gut pathology and an associated reduction in goblet cells, as seen with late treatment of chronic infection in AKR mice. This was also reflected in a thicker caecal submucosa in IL-33-treated mice (Fig. 5⇓, B and C), due largely to infiltrating inflammatory cells migrating into the gut and greater collagen deposition (data not shown). Previous work demonstrates that accelerated caecal IEC turnover is sufficient to induce T. muris expulsion in SCID mice (25). In light of these data, we sought to define whether exogenous IL-33 was altering IEC homeostasis. Using BrdU incorporation as an indicator of IEC division, it was clear that rate of new epithelium production was elevated in infected IL-33-treated mice, as indicated by the higher position of BrdU-stained cells along the crypt axis (Fig. 5⇓, B and C). Treatment also increased crypt length (Fig. 5⇓C), indicating greater proliferation at the base of the crypt was not matched by cell loss at the apex. Therefore, the rate of IEC turnover was not sufficiently elevated to expel the parasite, and a crypt hyperplasia occurred. IL-33-induced effects on goblet cells, crypt depth, submucosa depth, and epithelial cell turnover were dependent on parasite infection and not seen in naive SCID mice (Fig. 5⇓B). 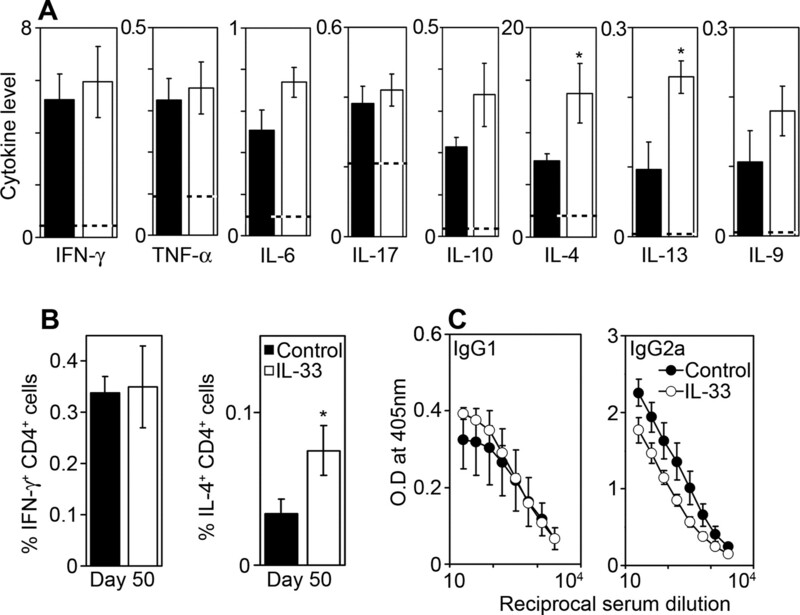 IL-33 effects in the absence of adaptive immunity were further demonstrated by an elevated MLN cellularity in infected IL-33-treated SCID mice, including an increase in (CD49b+) NK cells (Fig. 5⇓D). MLN cells from treated mice also produced more IFN-γ, although less TNF-α and IL-6 (Fig. 5⇓E); Th2 cytokines were below the threshold of detection. These data indicate IL-33 requires T cells to induce T. muris expulsion; however, changes in infection-associated pathology and new IEC production (but not turnover) in immunodeficient mice suggest that IL-33 can act on caecal mucosa independently of T cells. Exogenous IL-33 alters T. muris-associated caecal pathology, but is insufficient to induce parasite expulsion in the absence of adaptive immunity. IL-33-treated (□) and control SCID mice (▪) were orally infected with ∼100 embryonated T. muris eggs. IL-33 was given days −1 to 20 p.i. Caecal worm burdens were assessed day 21 and 35 p.i. (A). Goblet cells were visualized using periodic acid and Schiff’s reagent (PAS) and quantified (B and C). Caecal submucosa depth and crypt length (C) were measured as indicators of infection-associated pathology. Changes in IEC proliferation and homeostasis were assessed using a 16-h BrdU pulse; the cell position up the crypt axis of the highest BrdU-labeled cell was quantified (B and C). Scale bar = 100 μm. MLN cells were isolated and enumerated, and the number of CD49b+ cells was determined by FACS analysis (D). Supernatant from cultured MLN cells was assayed for IFN-γ, TNF-α, and IL-6; all cytokine data are pg/ml (E). CCU = Caecal crypt unit, scale bar = 100 μm; values represent mean ± SE for five animals per group. Dashed lines represent mean naive levels. ∗, Significant difference between IL-33-treated and control mice (p < 0.05). T. muris infection has been shown recently to induce IκΒ kinase (IKK) catalytic regulation of NF-κΒ activation (26). These kinases are essential for responses to all known proinflammatory stimuli and are vital for the regulation of mucosal inflammation and establishment of immunity to T. muris (27). What remains to be demonstrated is the signal that induces IECs to respond to the parasite in this manner. Obvious candidates are the proinflammatory cytokines of the IL-1 family because these cytokines use a signaling cascade that requires IKK-β phosphorylation (28). Indeed, IL-33 signaling has been demonstrated to be very similar to that of IL-1β (3). To investigate whether IL-33 could initiate the appropriate response from IECs, we assayed for epithelial cell-restricted cytokine TSLP gene expression as a surrogate marker of IEC IKK-β activity. TSLP gene expression has previously been shown to be defective in T. muris-infected IEC cell-specific IKK-β null mice, and this influences susceptibility to infection (27). In this study, we show that TSLP gene expression in resistant BALB/c mice reaches a peak on day 7 p.i. relative to naive (Fig. 6⇓A). Interestingly, the kinetics of TSLP expression lags that seen for IL-33 (Fig. 1⇑A), suggestive of a causal relationship. Again, as previously noted for IL-33, TSLP mRNA levels are not significantly altered from the naive baseline in the susceptible AKR mouse strain (data not shown). To establish whether this response was T cell dependent and inducible by exogenous IL-33, we investigated caecal TSLP and its receptor TSLPR mRNA levels in T. muris-infected SCID mice treated with IL-33. These data demonstrate TSLP and TSLPR gene expression are T cell independent and IL-33 can further significantly enhance TSLP levels and elevate TSLPR gene expression levels (Fig. 6⇓B). Therefore, this suggests IL-33 may also direct antiparasite Th2 immune responses via an indirect mechanism, using TSLP, a factor that has been shown to bias dendritic cells (DCs) to prime for Th2 polarization (27). T. muris infection induces TSLP mRNA synthesis; exogenous IL-33 elevated both caecal TSLP and TSLPR mRNA synthesis by a T cell-independent mechanism. BALB/c caecal cDNA was taken at various time points post-T. muris infection; quantitative PCR was then performed for TSLP and expressed relative to HPRT as a fold difference to uninfected levels; values represent mean ± SE for three animals per group. ∗, Significant difference between naive and infected mice (p < 0.05) (A). Quantitative PCR for TSLP and TSLPR expressed relative to HPRT as a fold difference to uninfected levels; in this instance, caecal cDNA was derived from infected SCID mice treated with or without exogenous IL-33; values represent mean ± SE for five animals per group (B). ∗, Significant difference between IL-33-treated and control mice (p < 0.05). In this study, we describe a number of key findings furthering the understanding of IL-33 biology. First, administration of IL-33 alone is sufficient to drive host expulsion of a gastrointestinal parasitic nematode. Second, this enhancing of Th2-associated immunity must occur at the initiation of the antiparasite response. Third, IL-33 acts in a non-T cell manner to exacerbate pathogen-induced mucosal pathology, and finally, this cytokine can potentially influence DC priming via inducing the IEC-derived factor TSLP, again enhancing Th2 immune responses. We demonstrate IL-33 is produced within the T. muris-infected caecum, and importantly, this occurs during the initial phase of parasite establishment. Epithelial cells have previously been identified as a primary source of IL-33 (3). Also, epithelial cells contributing to the cytokine milieu is not without precedence; indeed, T. muris-infected caecal epithelium has been demonstrated to innately produce factors associated with inflammation, such as IFN-γ, TNF-α, and the chemokine CCL2 (29). Because IL-33 is not secreted via the classical endoplasmic reticulum-Golgi route (3), release is likely to be limited to translocation of intracellular membranes (30) or the result of cell disruption. This is relevant to intestinal parasite infection because invading T. muris larvae generate syncitial tunnels within the caecal epithelium, and this process by its very nature causes cell damage (17). Potentially, cell disruption could stimulate the observed IL-33 mRNA production and subsequent release. IL-33 production early during infection at the site where parasite Ag is sampled is likely to be a critical factor conditioning whether the resulting T cell response is Th2 biased and is thus responsible for initiating parasite expulsion. It has previously been demonstrated that IL-33 and its receptor ST2 are fundamental to Th2-associated immunology. IL-33 alone can drive IL-4, IL-13, IL-5 production, eosinophilia, goblet hyperplasia, and high titers of IgE (3), whereas absence of the ST2 receptor reduces Th2-associated effector responses (7, 8). Indeed, a recent study demonstrates that soluble ST2 antagonizes IL-33 activity (31). In this study, we established in the context of a natural infection model that additional IL-33 was able to prevent a Th1 response and induce Th2-driven parasite expulsion. These data are reminiscent of those found with the related cytokine IL-1α, with which IL-33 shares a high sequence and structural homology (3). In vitro cultured IL-1α null cells are unable to Th2 polarize; also like IL-33, IL-1α mRNA is rapidly induced in mice resistant to T. muris infection, and unlike wild-type littermates parasite-infected IL-1α null mice are unable to mount a protective Th2 response (32). Thus, these sister cytokines are intimately involved with the generation and promotion of Th2-driven immune responses to gastrointestinal parasite infections. Indeed, within inflamed tissue, these related cytokines have dual activity functioning both extracellularly and as an intracrine factor regulating gene transcription (33, 34). Suggesting IL-33 and IL-1α both influence the parasite driven inflammatory response, potentially within cells at the site of infection and remotely as mature soluble factors. IL-33 can drive a naive host toward Th2 polarization and T. muris resistance; however, an established Th1 immune response is less amenable to IL-33 redirection. Interestingly, the archetypal Th2 cytokine IL-4 is sufficient to switch an established Th1 response and induce expulsion of a chronic T. muris infection (15). The failure of IL-33 to emulate this suggests a different role for this cytokine. Unlike IL-4, which is a master controller of Th cell differentiation, IL-33 appears to play a more subtle directing role. At the initiation of an adaptive response, IL-33 amplifies Th2 responses, causing a subsequent Th2 bias; however, IL-33 appears ineffective at altering an established Th1 response. This apparent window of action perhaps reflects the availability of interactions with ST2, the IL-33R. ST2 is found primarily on Th2 cells (6, 35), and is therefore rare in the context of a dominating Th1 response. Absence of this receptor will limit the effectiveness of exogenous IL-33. The observation that IL-33 alters infection-associated gut pathology even in the absence of a Th2 immune response alludes to an alternative modus operandi for this cytokine within mucosal tissues. The inability of IL-33 to induce T. muris expulsion in SCID mice demonstrates IL-33 acts on T cells to alter a susceptible phenotype; however, within the caecal mucosa of these mice, we again observed an IL-33-driven increase in tissue pathology and new IEC production. The observed increase in IFN-γ production from SCID MLN cells could account for this; indeed, IFN-γ has previously been shown to regulate IEC proliferation in the context of T. muris infection (36). Thus, elevated levels of IL-33 in SCID mice could be intensifying the infection-associated caecal pathology via IFN-γ. Indeed, these treated mice showed an elevation in NK cells within the MLN. These cells are a well-characterized source of IFN-γ (37) and have previously been demonstrated in SCID mice to be responsible for the disruption of intestinal tissue architecture in the context of infection with the intestinal helminth Trichinella spiralis, although in this case via the cytokine IL-13 (38). Whether IL-33’s ability to alter inflamed tissue in a non-T cell manner and the direct effects this cytokine has on T cell polarization are functions that influence one another remains to be resolved. The ability of IL-33 to enhance TSLP-induced responses from mature mast cells has recently been demonstrated (11). We also find that these two factors can interact in a positive manner; in this study, we show excess IL-33 enhances TSLP production within the caecum. Because TSLP has been shown to reduce DC-derived IL-12/23p40 and thus promote Th2 polarization (27, 39), it is conceivable that IL-33 can act via TSLP to promote Th2-driven immunity to T. muris infection. This study identifies IL-33 as a potent driver of Th2 immunity to intestinal parasites, demonstrating it is a cytokine that is induced early at the site of infection or if administered at this critical time, will induce T. muris expulsion. Thus, potentially, IL-33 could be providing the initial innate signal of parasite invasion to the host, priming the adaptive immune system to make the appropriate Th2-biased response. We also identify a possible mechanism by which IL-33 acts: excess IL-33 induces TSLP, an IEC-derived factor that is critical for T. muris expulsion and conditioning DCs to potentiate a Th2 immune response (27). IL-33 also plays a secondary T cell-independent role, exacerbating the pathology associated with a chronic infection, although the effects noted are dependent on time of assessment and the status of the host’s ongoing immune response, suggesting IL-33 plays subtly different roles in different inflammatory environments. This is consistent with a recent study demonstrating IL-33 is strongly associated with chronically inflamed tissue from patients with rheumatoid arthritis and Crohn’s disease (33). Thus, these data support the concept that IL-33 is a dual function cytokine similar to IL-1α (40), able to act remotely as a Th2 proinflammatory cytokine and locally as an intracellular NF that influences the severity of tissue inflammation. We thank Dr. Allison Bancroft and Dr. Louise Bell for critical reading of the manuscript and the members of the Immunology research group for helpful discussions. ↵1 Studies performed at University of Manchester were supported by Medical Research Council Grant 71672 and Wellcome Trust Grant 064820, and at the University of Glasgow by Medical Research Council Grant 69296 and Wellcome Trust Grant 080217. ↵3 Abbreviations used in this paper: TSLP, thymic stromal lymphopoietin; CBA, cytometric bead array kit; DC, dendritic cell; ES, excretory/secretory; HPRT, hypoxanthine phosphoribosyltransferase; IEC, intestinal epithelial cell; IKK, IκΒ kinase; MLN, mesenteric lymph node; p.i., postinfection. Dinarello, C. A.. 2000. Interleukin-18, a proinflammatory cytokine. Eur. Cytokine Network 11: 483-486. Dinarello, C. A.. 1996. Biologic basis for interleukin-1 in disease. Blood 87: 2095-2147. Chackerian, A. A., E. R. Oldham, E. E. Murphy, J. Schmitz, S. Pflanz, R. A. Kastelein. 2007. IL-1 receptor accessory protein and ST2 comprise the IL-33 receptor complex. J. Immunol. 179: 2551-2555. Xu, D., W. L. Chan, B. P. Leung, F. Huang, R. Wheeler, D. Piedrafita, J. H. Robinson, F. Y. Liew. 1998. Selective expression of a stable cell surface molecule on type 2 but not type 1 helper T cells. J. Exp. Med. 187: 787-794. Iikura, M., H. Suto, N. Kajiwara, K. Oboki, T. Ohno, Y. Okayama, H. Saito, S. J. Galli, S. Nakae. 2007. IL-33 can promote survival, adhesion and cytokine production in human mast cells. Lab. Invest. 87: 971-978. Cliffe, L. J., R. K. Grencis. 2004. The Trichuris muris system: a paradigm of resistance and susceptibility to intestinal nematode infection. Adv. Parasitol. 57: 255-307. Roach, T. I., D. Wakelin, K. J. Else, D. A. Bundy. 1988. Antigenic cross-reactivity between the human whipworm, Trichuris trichiura, and the mouse trichuroids Trichuris muris and Trichinella spiralis. Parasite Immunol. 10: 279-291. Else, K. J., F. D. Finkelman, C. R. Maliszewski, R. K. Grencis. 1994. 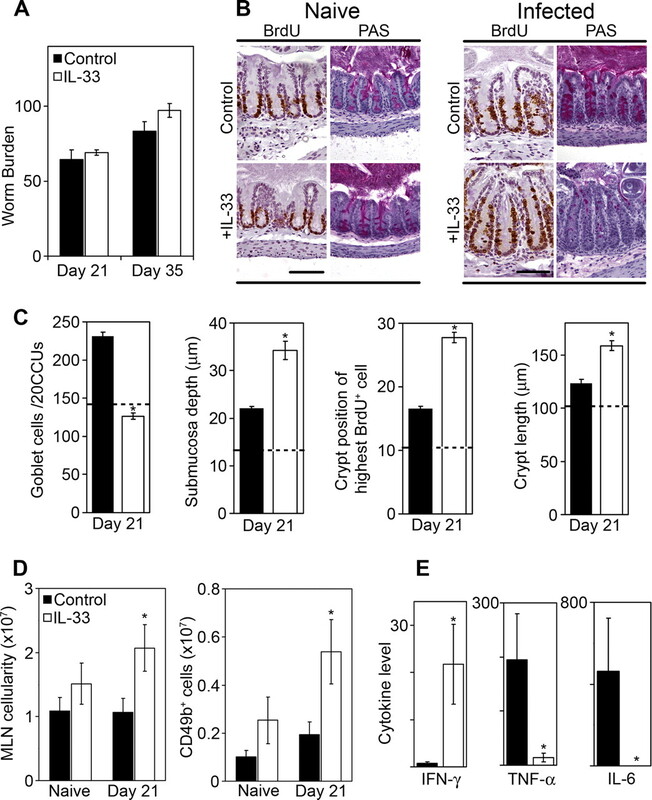 Cytokine-mediated regulation of chronic intestinal helminth infection. J. Exp. Med. 179: 347-351. Bancroft, A. J., D. Artis, D. D. Donaldson, J. P. Sypek, R. K. Grencis. 2000. Gastrointestinal nematode expulsion in IL-4 knockout mice is IL-13 dependent. Eur. J. Immunol. 30: 2083-2091. Wakelin, D.. 1967. Acquired immunity to Trichuris muris in the albino laboratory mouse. Parasitology 57: 515-524. Else, K. J., G. M. Entwistle, R. K. Grencis. 1993. Correlations between worm burden and markers of Th1 and Th2 cell subset induction in an inbred strain of mouse infected with Trichuris muris. Parasite Immunol. 15: 595-600. Potten, C. S., D. Booth, N. J. Cragg, G. L. Tudor, J. A. O’Shea, C. Booth, F. A. Meineke, D. Barthel, M. Loeffler. 2002. Cell kinetic studies in the murine ventral tongue epithelium: mucositis induced by radiation and its protection by pretreatment with keratinocyte growth factor (KGF). Cell Prolif. 35: (Suppl. 1):32-47. Pfaffl, M. W.. 2001. A new mathematical model for relative quantification in real-time RT-PCR. Nucleic Acids Res. 29: 2002-2007. Else, K. J., D. Wakelin, T. I. Roach. 1989. Host predisposition to trichuriasis: the mouse–T. muris model. Parasitology 98: 275-282. Schopf, L. R., K. F. Hoffmann, A. W. Cheever, J. F. Urban, Jr, T. A. Wynn. 2002. IL-10 is critical for host resistance and survival during gastrointestinal helminth infection. J. Immunol. 168: 2383-2392. Grencis, R. K., G. M. Entwistle. 1997. Production of an interferon-γ homologue by an intestinal nematode: functionally significant or interesting artefact?. Parasitology 115: (Suppl. 7):S101-S106. Spahn, T. W., H. Herbst, P. D. Rennert, N. Lugering, C. Maaser, M. Kraft, A. Fontana, H. L. Weiner, W. Domschke, T. Kucharzik. 2002. Induction of colitis in mice deficient of Peyer’s patches and mesenteric lymph nodes is associated with increased disease severity and formation of colonic lymphoid patches. Am. J. Pathol. 161: 2273-2282. Cliffe, L. J., N. E. Humphreys, T. E. Lane, C. S. Potten, C. Booth, R. K. Grencis. 2005. Accelerated intestinal epithelial cell turnover: a new mechanism of parasite expulsion. Science 308: 1463-1465. Ghosh, S., M. Karin. 2002. Missing pieces in the NF-κB puzzle. Cell 109: (Suppl. 2):S81-S96. Zaph, C., A. E. Troy, B. C. Taylor, L. D. Berman-Booty, K. J. Guild, Y. Du, E. A. Yost, A. D. Gruber, M. J. May, F. R. Greten, et al 2007. Epithelial-cell-intrinsic IKK-β expression regulates intestinal immune homeostasis. Nature 446: 552-556. Delhase, M., M. Hayakawa, Y. Chen, M. Karin. 1999. Positive and negative regulation of IκB kinase activity through IKKβ subunit phosphorylation. Science 284: 309-313. DeSchoolmeester, M. L., H. Manku, K. J. Else. 2006. The innate immune responses of colonic epithelial cells to Trichuris muris are similar in mouse strains that develop a type 1 or type 2 adaptive immune response. Infect. Immun. 74: 6280-6286. Rubartelli, A., F. Cozzolino, M. Talio, R. Sitia. 1990. A novel secretory pathway for interleukin-1β, a protein lacking a signal sequence. EMBO J. 9: 1503-1510. Helmby, H., R. K. Grencis. 2004. 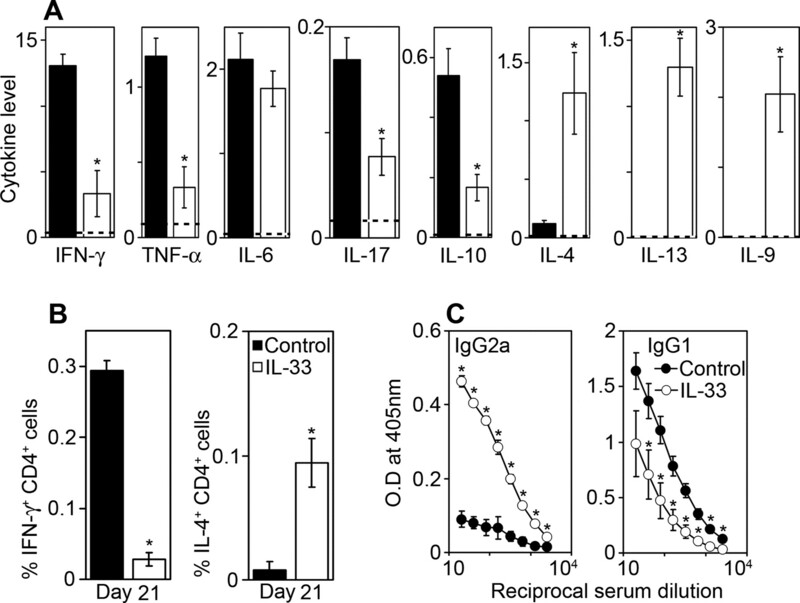 Interleukin 1 plays a major role in the development of Th2-mediated immunity. Eur. J. Immunol. 34: 3674-3681. Curtis, B. M., M. B. Widmer, P. deRoos, E. E. Qwarnstrom. 1990. IL-1 and its receptor are translocated to the nucleus. J. Immunol. 144: 1295-1303. Artis, D., C. S. Potten, K. J. Else, F. D. Finkelman, R. K. Grencis. 1999. Trichuris muris: host intestinal epithelial cell hyperproliferation during chronic infection is regulated by interferon-γ. Exp. Parasitol. 92: 144-153. Shen, F., X. L. Xu, L. H. Graf, A. S. Chong. 1995. CD45-cross-linking stimulates IFN-γ production in NK cells. J. Immunol. 154: 644-652. McDermott, J. R., N. E. Humphreys, S. P. Forman, D. D. Donaldson, R. K. Grencis. 2005. Intraepithelial NK cell-derived IL-13 induces intestinal pathology associated with nematode infection. J. Immunol. 175: 3207-3213. Liu, Y. J., V. Soumelis, N. Watanabe, T. Ito, Y. H. Wang, R. W. Malefyt, M. Omori, B. Zhou, S. F. Ziegler. 2007. TSLP: an epithelial cell cytokine that regulates T cell differentiation by conditioning dendritic cell maturation. Annu. Rev. Immunol. 25: 193-219. Werman, A., R. Werman-Venkert, R. White, J. K. Lee, B. Werman, Y. Krelin, E. Voronov, C. A. Dinarello, R. N. Apte. 2004. The precursor form of IL-1α is an intracrine proinflammatory activator of transcription. Proc. Natl. Acad. Sci. USA 101: 2434-2439.